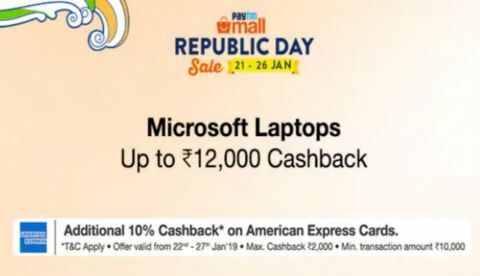 If you have missed Amazon and Flipkart's respective sales, you might want to check out Paytm's Republic Day Sale. The platform is offering discounts on a wide range of gadgets that includes smartphones, laptops, audio accessories and more. Besides that, the e-commerce platform has also collaborated with American Express and giving an extra 10% discount to those who will make payment through the bank’s debit or credit card. So, let’s begin. The Microsoft Surface Pro is a touch screen convertible laptop that sports a 12.3-inch Quad HD+ display. The device is pre-installed with Windows 10, which means you don’t have to spend money on buying an OS for your system separately. It is powered by an Intel Core i5 7th Gen processor, which is paired with 4GB RAM and 128GB internal storage. During the sale, you can get this device for Rs 68,333 that includes Rs 3,000 cash back as well. Check out the deal here. The Microsoft Surface Book 2 is a bit expensive than most of the other laptops that are available in the market. It comes with an Intel Core i5 7th Gen processor and packs an 8GB RAM and 256GB internal storage. The laptop was launched in India with an MRP of Rs 1,43,990. Now during the sale, you can get it for Rs 1,22,999, including Rs 15,000 cash back. Check out the deal here. This is the 256GB variant of the Microsoft Surface laptop, which is priced at Rs 93,999. The laptop offers the same configurations as the other than that we mentioned above in the list. However, in this, you get more storage space. During the sale, you can get it for Rs 90,239 that includes 3,700 cash back. Check out the deal here.